Unsatisfied with President Ma Ying- jeou’s promises, the students occupied the houses of government, after having staged a sit-in at parliament. The operation – which sparked conflict – ended at dawn today. Some young students’ frustration resulted in vandalism. The students speak to AsiaNews. Taipei ( AsiaNews) - Taiwanese police dragged thousands of students away from government buildings this morning. Riot police forcibly cleared the young people from the buildings which they had occupied yesterday. About 60 people were arrested and at least 100 injured in ensuing clashes with the police, who also used batons and water cannons. Students had occupied the seat of parliament since March 18 to protest a draft economic agreement with China, which, in their opinion, may threaten the freedom of the island and undermine their job prospects. The tension has been mounting since yesterday. In the morning, President Ma Ying- jeou (马英九) held a press conference to explain the motives for the trade agreement. He thanked the students for their stance promising that he would review the entire agreement with them step by step, but reaffirmed the need for economic competitiveness with other emerging countries. Asked by a foreign reporter if "pressure from Beijing" was also among the reasons the president responded: "We are doing this of our own accord. It basically comes down to our economic survival. If we lose market share, others will take our place and we will be pushed to the margins and begin an irreversible decline. We are not under anyone's orders and do not want to lose what Taiwan has built in the last 40 years". Responding to those who asked him if the accord was legal, the president responded that everything had been done according to the law. "But in order to avoid misunderstandings we want to review each item, one by one, so that everyone is convinced that we have chosen the best way forward". His response however, failed to satisfy the students who also occupied the government building later in the evening (行政院.) The decision was taken by the student leader, Lin Fei -fan (林飞帆) who invited those who were protesting outside to cross the road, ZhongShan Bei St.(中山 北路) to and take over the government building. Until then, the police who were few in number and were only carrying light arms had been given orders not to strike and to curb the great mass of students in the least violent manner possible. No-one was to be hurt to avoid creating any heroes. Thus the students were able to peacefully occupy the parliament, opening a hole in the barbed wire fence. 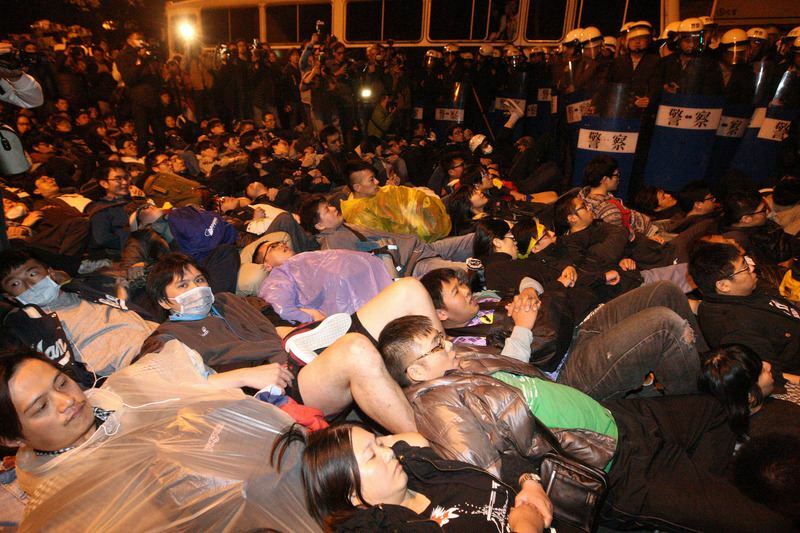 After 23.00, however, the police were ordered by the Prime Minister Jiang Yi- Huah (江宜桦) , to begin the forced eviction, dragging students away even using tear gas, batons and water cannons. At half past midnight an even more massive eviction began with more than three thousand highly trained police officers who wore helmets and carryied riot shields Starting from the back of the government palace, in Bei Ping Dong (北平 东路) the total eviction of students began. The students lay down prone on the square following non-violent tactics. Under the lenses of TV cameras and photographers, the police began a slow but inexorable eviction literally shifting the protesters one by one, most of whom wept disheartened as they were dragged away. The cameras were then forced to leave and an the eviction continued with some injuries among the students. Opposition party leaders, including Tsai Ing- wen (蔡英文) and Frank Hsieh (谢长廷) of the Democratic Progressive Party (民进党) arrived towards 01:30. They, too, sat down on the street in front of the government building, in the front row with the students, awaiting the arrival of the police. Outside the massive police presence, a number of ambulances were stationed to treat the injured. The doctor interviewed by one of the journalists reported that up to that moment (three o'clock) the number of students taken to the hospital for check-ups or for wounds sustained during the evacuation was 37. At the end of the long night the hospital released a more precise figure of at least four students who fell from ladders in an attempt to enter the building, one was even hospitalized for electric shock after mistakenly entered the room of one of the generators current and others for injuries sustained during the breaking of the windows. Around five in the morning the evacuation was completed, the police deployed seven vehicles with water cannons to permanently remove the crowd from above the main street, Zhong Xiao Dong St. (忠孝 东路) which had been blocked to traffic for the whole night and normal movement allowing public transport to bring people to work or school resumed. At 8:15 this morning there was a private meeting between the president Ma and the prime minister Jiang, who stated that it was regrettable that some groups of students had chosen to become violent. AsiaNews interviewed two students who belong to the group that had invaded the parliament. They say that after meeting with the Prime Minister Jiang Yuhua, the union between the students began to split because according to many their protest had failed because it was not achieved its main goal. Some groups started to use more violent forms of protest, despite the calls of their leader, and to destroy as much as possible, as evidenced by this morning by scenes from inside of the government palace, including the prime minister's office . Accessible to reporters and cameras, the corridors and the rooms are totally devastated with considerable damage to furniture, doors and windows, many of them completely vandalized. The offices are unrecognizable, stacked with piles of destroyed material, including expensive computers. One of the students says: "We did not want it to arrive at such extremes, that was not the spirit of our protest, we understand the frustration but we are a non-violent movement, this is why we chose the sunflower as a symbol". In a brief press conference in the morning the Prime Minister stated that he was saddened by the fact that a civil and non-violent protest, as was demonstrated for up to two days before, had degenerated into violence because of some groups motivated by a desire to wreak havoc rather than willingness to cooperate.